Toyota Stadium, with its ingenious design and functional facilities, delivers dreams and excitement to all visitors through activities ranging from international events to daily park use. All seats are individual type and have backrests and spacious leg room, allowing you to enjoy the event in comfort. 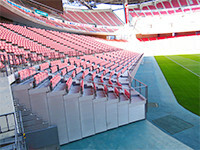 The upper stand is sloped up to 38 degrees. This allows even those people in the back seats to have a good view of the field without heads from seats in front of them blocking their view. 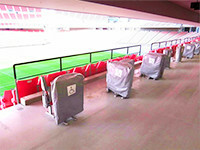 Movable seating with about 2,438 seats is stored in the space under the 1F side stand. 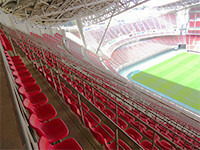 The standard 42,562 seating can be expanded to a maximum of 45,000 seats, depending on the size of the event. 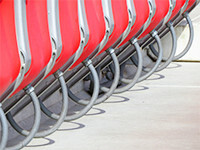 With its elimination of uneven surfaces and its non-slip floors, wheelchair-designated seating areas, and easy-to-read guide displays, the stadium has adopted an universal and accessible design throughout. In order to smoothly facilitate the congested times during events, floors 1 to 4 are all equipped with both men’s and women’s restrooms, with a total of 680 toilet units available. Multipurpose toilet facilities have been provided in 23 locations to address the needs of expecting mothers, parents with small children, and persons in wheelchairs. The center section of 1F has built-in seat heating for 4,000 seats, providing comfort to sports spectators even in the cold winter. 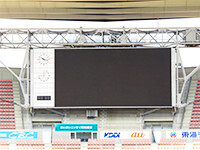 LED full-color screen - 9.6 m (H) × 19.2 m (W). In addition to the display of characters for player names and score information, the equipment can also show still images and videos, ideal for use in events such as film screenings and public viewings. 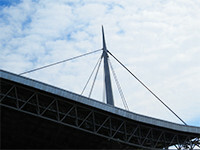 The roof for the main and back stands is an unique structure suspended by cables from 4 huge masts. This eliminates the need for pillars that could interfere with the view from the stands, ensuring impressively ideal visibility. 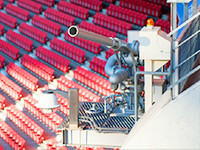 The stadium has a 24-hour disaster-prevention and security system in place to allow everyone to use the venue with peace of mind. The stadium has a structure that can withstand an intensity level 7 earthquake and strong winds up to 80m/sec and is equipped with 3 water cannons that automatically discharge water when a fire occurs, surveillance cameras, and more. The stadium provides 264 seats for the media, each with a desk equipped with a 100V power outlet and telephone line to allow for various news reporting and gathering activities. 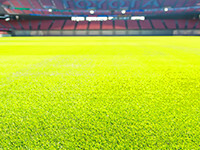 Natural grass is used to capture optimal performance from the athletes. It has a special multi-layer structure ideal for water drainage, sprinklers, and an underground-heating system that uses hot water piping.